Those darn Collachs! Some of my frustrations are aired on FaceBook and mailing lists, but I might as well elucidate here. For the record. Notice I’ve included some views of Coll to relieve the monotony between questions. Linda Temple has sent some much appreciated photographs. In 2007 I had drafted a 19-page McFadyen family history. Today it is over 40 pages, without intensive time spent on it. And that is not following every child of every child. It seems the more the miraculous Internet expands, the more there is to explore—so helpful when distant from the ancestral site. As I go through it to clean up my footnotes, every page presents opportunities for additions. Still, some of the resources at my disposal raise troubling genealogical questions. Maybe this diversion to my blog will draw some answers. She said, wishfully. Being basically lazy, I hope for answers from those wiser in Scottish ways. Maybe I will have to blog more than once on these questions that painfully bog down the writing. This year I received several pounds of paper copies of almost the entire Kirk Session minutes for the Isle of Coll. They have serious time gaps from 1733 and quite a few pages of illegible handwriting. The gaps can be explained historically. The incumbent minister, if there was one, had equal duties on the Isle of Tiree or elsewhere, depending on the time period. The handwriting, well ... we know paper was expensive in the olden days and those Presbyterians righteously crammed a lot onto one page. Truthfully, I have reviewed every page. That’s obvious from the forest of sticky notes flopping off the top and sides of the pile. Have I done anything about it? Ummmm. The proper answer seems to be to create a chart or spreadsheet or database for all the McFadyen mentions. An attempt at family reconstructions. And why would I do that? The answer here must be because they are all more or less related at some historical point and MY people are mostly missing in those church minutes. Some of the others could be siblings of my Donald the Soldier, or even his parents’ generation. The proceedings of the Kirk elders are liberally interspersed with lists of baptisms and marriages, albeit a few missing pages here and there in my copies, inexplicably. Among the actual minutes are copious references to illegitimate pregnancies, the result of criminal connexion, as the elders liked to say (often abbreviated as crim con which has a nice modern ring to it). Sometimes the guilty parties even agreed to marry, if they were not already married to someone else. Q #2: Are Coll & Tiree OPRs actually included on the IGI? I know they have been filmed by the LDS, and thanks to volunteers have been sorted and indexed on collgenealogy.com. Five of MY baptisms do appear on the latter, corresponding to patron submissions on the IGI, which also correspond to information sent to me by a local Coll historian in the early 1980s. But they are missing on the IGI extractions of parish registers (OPRs) regardless of every surname spelling I can come up with. Next. The Presbyterian Short Catechism aka Westminster Catechism (1674) is important with regard to a complete list of the just under 1,000 inhabitants of Coll in 1776. The newly appointed clergyman visited every household and asked the questions of the faith to guage the local level of piety. His list is duly entered in the Kirk Session minutes. * I learned the catechism is instructional in nature, consisting of 107 questions (imagine what the long version must look like), being especially appropriate for youngsters and the illiterate. In the 1776 record, adults have both first names and surnames. This applies to husbands and wives and adult children. Under-age children have first names only. Here is where I run into a bit of trouble. Most sources I’ve seen concur that under-age means under the age of seven years. Nevertheless I have a dissenting opinion, from a Coll local historian, that under-age refers to under twelve years of age. Q #3: You saw it coming: does "under-age" mean children under seven or under twelve? Is there a reliable source to consult/cite? Next. In that 1776 list, the wives are identified with their birth surnames according to Scottish custom. There are some widows whose households have only under-age children, i.e. the children are mentioned merely as first names. Q #4: Do the widows bear the surname of their deceased spouse or their birth surname? The question has a direct impact on what surname those underage children were known by. Four questions. I’m sure I’ll think of more. * For those with no access to the Kirk Session minutes, the 1776 list is thankfully transcribed at collgenealogy.com. Top: Coll parish church, Arinagour, Coll; Linda and John Temple. Middle: Cemetery at Crossapol, Coll; Linda and John Temple. 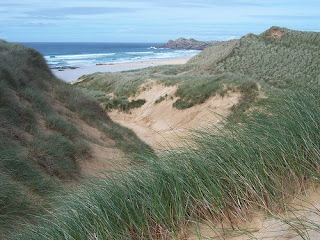 Bottom: Traigh Hogh, Coll; by fishski at flickr.com. Photographic credit as shown. Look carefully; it's not what you first think! Luckily I inherited oodles of old family photographs. Some of them have notes on the back to say who they are. Some of them don’t, and we all know how bad that is. A lot of them were identified for me by parents or grandparents. But a few ancestral lines apparently avoided the photographer as much as they shied away from other kinds of informative records. 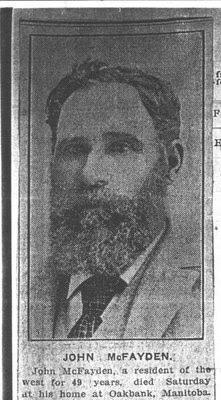 “John McFayden,” Winnipeg Free Press, Monday, 2 August 1915, p. 10, digital image, NewspaperARCHIVE (http://www.newspaperarchive.com : accessed 15 May 2009). John Hector McFadyen was born in Cape Breton in March of 1838, if we believe the 1911 census, and died 31 July 1915 at Oakbank, Manitoba. He came from a family of twelve children born to Hector McFadyen and his wife Jessie McKenzie of River Denys, Cape Breton. “John Hector” distinguished him from his slightly younger brother John Jr. aka “John Lauchlin,” not to be confused with their brother Lauchlin! (Highlanders had their reasons for same names in one family, obscure as they may be to us). Since most of the brothers were seamen, including my John, it’s something of a miracle he made it all the way to Manitoba to become a homestead farmer. Two other brothers drowned on the Grand Banks after he left. John sailed his own boat to Provincetown, Massachusetts, where he married and the first two children came along. By 1874 he was established on a quarter section of rich Manitoba soil at Oakbank, in what would become the Municipality of Springfield. The two brothers called John, both long removed from the old family base in Cape Breton, were sometimes merged in reminiscences of the next generations. John Lauchie had apparently been smitten with gold fever and rarely visited home again, travelling to many foreign places. He did write letters, some saved by descendants of his youngest sister. And he probably sent photographs, now lost or unidentified. His last letter to Cape Breton came from Singapore on the Malay Peninsula, thus it was assumed he died there, although Sumatra was also mentioned. John Hector’s obituary says he was survived by all ten children, five sons and five daughters. Little did they know that his youngest son Willie would die a year later in France with the 1st Canadian Mounted Rifles. His son Bob would die five years later in a house fire at Oakbank. That left three sons, none of whom had children—my McFadyen line “daughtered out” as we say. A couple of the surviving sons show promise of real live family black sheep (.. goody ..) for future posts. I treasure that clipping—the ONLY picture I have of him. Someone, somewhere, once had the original photo. One of the daughters, no doubt. The 5th edition of the Canadian Genealogy Carnival is all about favourite Canadian vacations. Where did your ancestors like to spend their summer holidays? Did your family enjoy a favourite beach or cottage? Or did your family travel from sea to shining sea? Photographs of these holiday places is encouraged. When I was a kid, every summer was the favourite vacation. That’s because we left the city behind and drove fifteen miles to our camp for two months. In Northwestern Ontario what we call camps, you call cottages or cabins. Imagine driving only ten or fifteen miles to be in the bush on a lake. However, I’m speaking of a camp on the greatest lake of all, Lake Superior. Amethyst Harbour was the most magical of places for kids. Our first camp was old before my parents bought it, before the Second World War! It had four bedrooms, a massive iron cook stove and no indoor plumbing. But we never spent much time inside. If we were lucky, the kids had the option of sleeping in a tent in the back yard. Our parents probably thought we actually slept! One night my dad’s friend, a few sheets to the wind as we used to say, broke his ankle tripping over our chamber pot. The campers’ association hired a summer instructor for swimming, tennis, badminton and baseball. In fact, baseball became a highly competitive sport among teams along the shore. We had regular hikes to nearby areas for picnics and games ... McKenzie pool, McKenzie Falls and Wabang ... Run sheep run! Bonfires and wiener roasts were special events for staying up late. Evening fishing was usually a family event: you would see all the motor boats leaving their docks for the open water to slowly troll for trout. You could wave at your friends but you were supposed to be quiet and not scare the fish away. In those days, 30-pound lake trout were not uncommon. Every year included a trip in the big boat to Nipigon Bay for the “world famous” Rossport Fish Derby. Being allowed to steer the boat and learn the charts were highlights, although you paid for it by swabbing the decks and polishing chrome. Otherwise, kids were allowed to run mostly wild and barefoot. We knew every inch of the territory ... the beaches, the cliffs, the old amethyst mines and the surrounding forest. Every age group had a gang and a gaggle of bicycles for the fastest route between points A and B. We would take sleeping bags to deserted Lambert Island, watching incredible shooting stars and aurora borealis all night. We became proficient with our ever-present boats, sometimes venturing across Thunder Bay to lonely Caribou Island. Once, one of those unexpected Lake Superior storms came up before the boats could return. Terrified parents launched their bigger boats for search and rescue but all ended well. Those young lads knew their boats, alright, and they knew Lake Superior. To us, it was just part of the ever-exciting summer adventure. We built a new camp with mod cons. As kids got older, cars began to replace the bicycles. Nevertheless, no matter what age we were, no-one wanted to miss the annual long-weekend sports days. Now, there are fifth and sixth generation campers returning each summer. Tuska the ancient fisherman is long gone. Lambert Island is populated. But Lake Superior never loses its seductive power and Amethyst Harbour retains its magic for every new generation of kids. I don’t know about you, but I need a regular camel fix, and it’s been a while. The biggest decision is which one in my growing photo collection to feature each time. There is the close-up of Zou-Zou my runaway camel, but that’s a whole story in itself. A certain cartoon I will save. And a friend sent me her photo of a very unusual baby, which really needs special background information if only I could read Arabic because English websites are not giving it up. 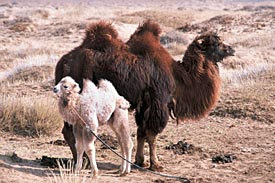 Mongolia is a hotspot for camels of the Bactrian variety. It’s also home to a large part of the Gobi Desert which explains a lot. Before people started mass printing of dumb slogans on T-shirts we used to have a joke about the Gobi Desert Canoe Club. 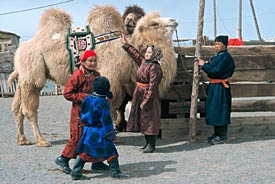 Mongolians are probably still more traditionally tied to a nomadic life than their Bedouin counterparts in the Middle East. 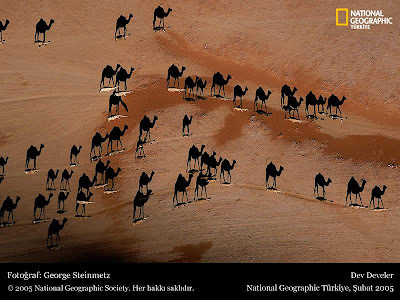 Camels are like their staff of life, a multi-tasking beast for transport, food, wool, leather and fuel (dried dung, for those of you have never crossed a cow pasture in the fall). There are deserts and then there are deserts. The Gobi can get very cold in winter. The wild camel population in the Gobi diminished considerably during the last twenty-five years or so for various reasons—political mismanagement, demand for meat, parasites (I know, the last two do not sit well together). Finally a Wild Camel Protection Foundation was formed to establish protected areas and breeding programs. Thankfully the distinguished patrons are holding up their end with impressive contributions in GBP, since I don't seem to have much in the way of £ lying around. Brenda has not been to Mongolia to investigate this situation. Yet. But I have a connection. My daughter the yarn craft merchant was able to obtain “100% Mongolian camel down” through co-ops and agencies who market developing-world crafts ... so clever she is. The name of the wool spinner is right there. Daughter knew I needed a shawl in the office for winter chill and went to work on it. She added her own bits for colour. Some gifts are warm and priceless. First two photographs courtesy of National Geographic Magazine (http://www.nationalgeographic.com/weepingcamel/thecamels.html). Third photograph BDM.